Free quilt patterns for small projects through to full size quilts - click on a picture to download the pdf instructions. Make sure you visit regularly as we will be adding new designs as they are finished! 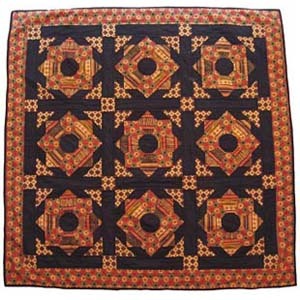 Would you like to receive free quilt patterns by email? Simply sign up with your email in the form below to receive free patterns direct to your email address as we design them (up to a maximum of 4 per month) - never go short of ideas with this free resource! Dresden Plate cushion cover pattern - If you've never tried a Dresden plate block before, this striking cushion cover or wallhanging pattern is the perfect place to start! You can use a Dresden plate ruler to create the petals, or alternatively we have provided the shape as part of the pattern that you can trace to create your own template. The pattern uses the beautiful Summer Breeze fabrics by Moda, and has instructions for either a wallhanging or cushion cover - we also have a quilt kit in stock that contains everything you need to make the cushion cover, including all the fabric and wadding, you just need to add thread and a cushion pad! Once Upon a Rhyme cot quilt pattern - This simple cot quilt uses the Once Upon a Rhyme quilt panel by Riley Blake Designs - instead of making a book with the panel, we have designed this quilt that includes 4 of the illustrated nursery rhymes, along with coordinating plain fabrics. We have suggested the quilt is fleece backed, so it is small and light enough to be used as a pram quilt and tucked into a baby bag, but robust enough to be used as a playmat for smaller babies! This is a straightforward project, ideal as a last minute present, but the use of plain fabrics means it could be also embellished with quilting or embroidery to make a truly unique heirloom - it will be treasured either way! We have a kit in stock containing everything you need to make the quilt, including all the fabrics, fleece backing and full colour instructions - all you need extra is thread! 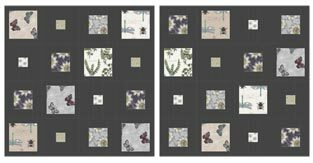 Bijoux Bedrunner quilt pattern - Using the beautiful Bijoux fabrics from Makower, this bedrunner quilt pattern makes great use of the tiny prints and muted colours of the collection. 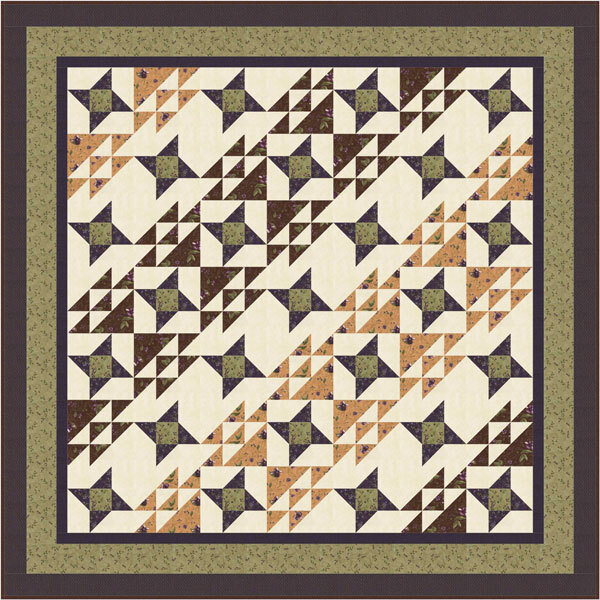 In the traditional 'Card trick' design, this two block quilt would be perfect to warm your feet on cold Winter nights - bringing a homely feeling to your bedroom or adding a touch of homespun style to a guest bedroom! We have a kit in stock containing everything you need to make the quilt top and binding - the perfect project to practise your points! 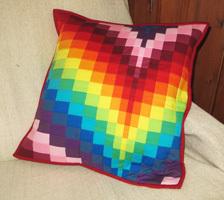 Rainbow bargello cushion cover - If you love the bargello style of piecing but find the thought of a whole quilt a bit daunting, this bargello cushion cover is a great way to try the technique on a smaller scale! Using bright colours from our Makower plains collection, this fun cushion cover will bring a splash of colour to any room! We have a kit in stock containing everything you need to make the cushion cover - including fabric, wadding and backing, all you need is thread! 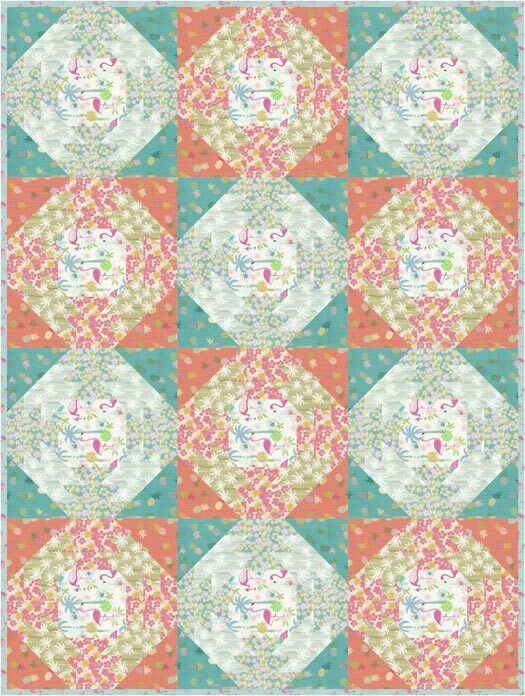 Cool rainbow quilt - A pattern to make this beautiful quilt using fabrics from our Art Gallery Fabrics Floral Elements fabric section. 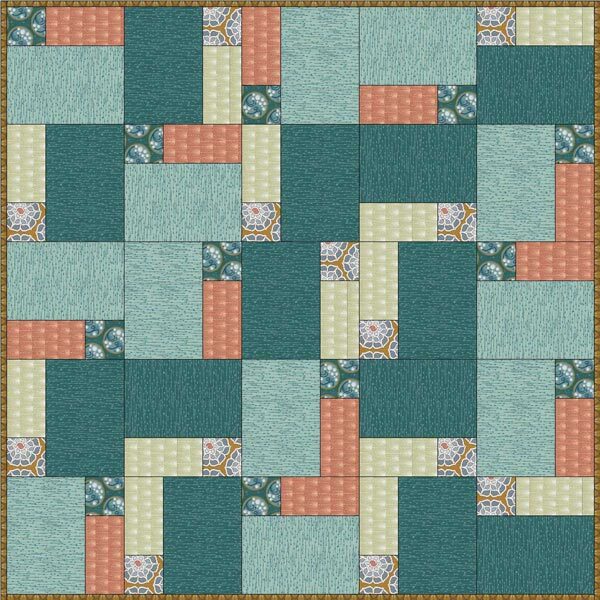 The colours are selected from the cooler end of the spectrum and the use of strong and pale colours creates almost an optical illusion effect, while the pattern is easy to follow and suitable for beginner to intermediate quilters. We have a kit in stock containing all the fabrics and wadding you need to make the quilt top and binding, plus full colour instructions, you can find the kit here. 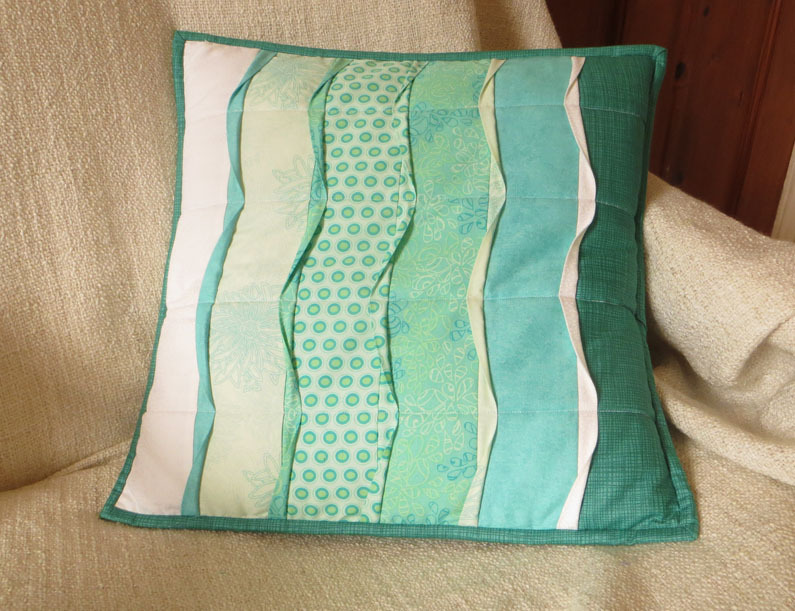 Wave cushion cover - A pattern to make this fresh looking wave design cushion cover using fabrics from our turquoise fabric section. This effective textured design creates a complicated looking effect using a simple folded fabric technique, so it is perfect for beginners. We have a kit in stock containing all the fabrics and wadding you need to make the cushion cover, plus full colour instructions, you can find the kit here. 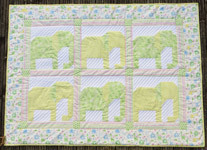 Elephant cot quilt - Make this fun, elephant themed quilt in neutral colours from the Bobo Baby fabric range, perfect as a gift for a new arrival!. Great to practise your rotary cutting and piecing skills as the elephants are made up from smaller patches, but straightforward enough for beginners and intermediate quilters alike. 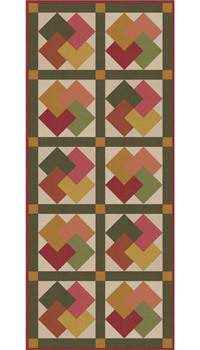 Autumn Weave quilt - Make this small quilt in beautiful Autumnal colours from Makower's Spraytime range. Perfect as a lap quilt, throw or picnic blanket, this is a deceptively easy quilt to make, with the complicated looking weave effect achieved using only 2 simple blocks - great for beginners! 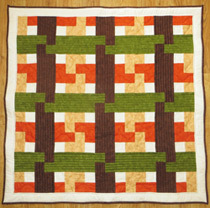 We have a kit available containing all the fabrics required to make the Autumn Weave quilt top and binding here. Tropicana picnic blanket - Make this gorgeous picnic blanket using fabrics from the Tropicana range by Lewis & Irene. Tropical prints in bright colours make a picnic blanket it would be a pleasure to relax on, or you could use it as a throw to brighten a lounge or conservatory for the summer! The pattern is based on the pineapple design, the instructions are written to make the blocks using the rotary cutting technique but a foundation pattern is also included if you prefer that method. The Botanist cushion covers - Make this pair of matching cushion covers using fabrics from The Botanist collection by Lewis and Irene. Lovely neutral shades make these cushion covers ideal for a modern house, with the Victorian botany book style prints adding interest. 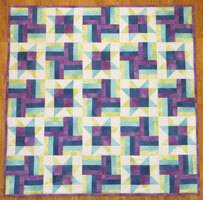 This is an easy pieced design perfect for beginners. The pattern is designed so that you can use a 10 piece stash pack for all the prints, so take a look at our stash pack collection for other colour options! 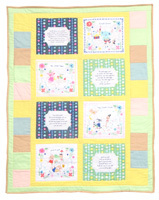 Benartex Bunny Hop baby quilt - Make this gorgeous baby quilt using the foundation piecing method (a great tutorial for this method can be found here). 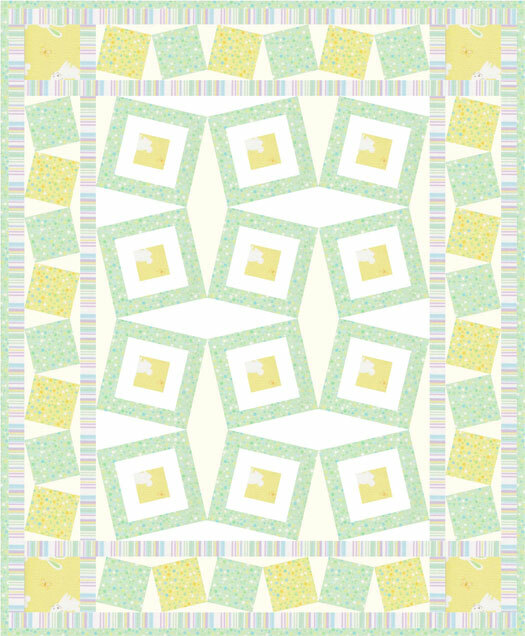 This free baby quilt pattern has full colour instructions to make a 33" x 39" quilt, perfect as a baby cot quilt or playmat. The pattern uses the neutral colours from the collection, but Bunny Hop also has all the fabrics in blue or pink so you can adapt it to your needs. The foundation block patterns can also be downloaded to print - click for the small block pattern or the large block pattern. Moda Simply Colourful quilt - brighten up your home with these jewel bright colours from the Moda Simply Colourful range. This free quilt pattern has full colour instructions to make a 52" x 52" quilt, ideal to use as a throw over the back of the sofa! Alternative suggestions for colour and fabric schemes are included with the pattern. 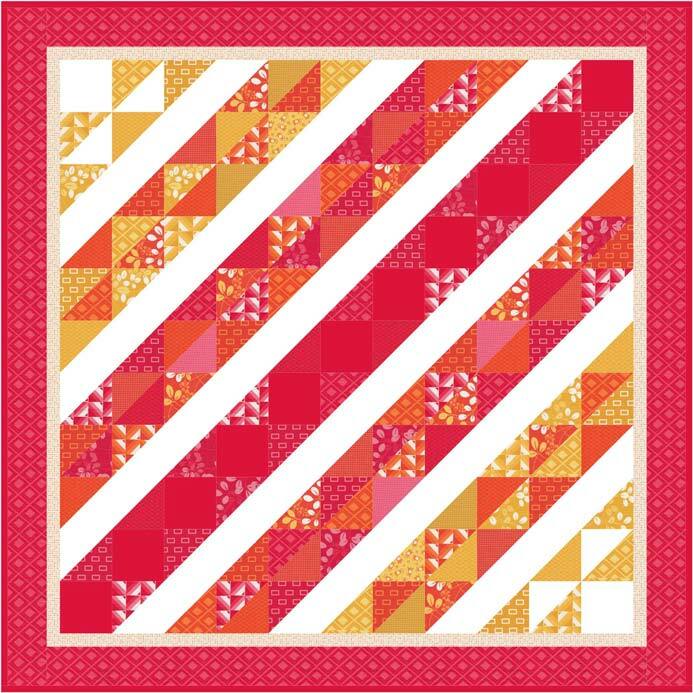 A kit containing everything you need to make the Moda Simply Colourful quilt top and binding is available here. 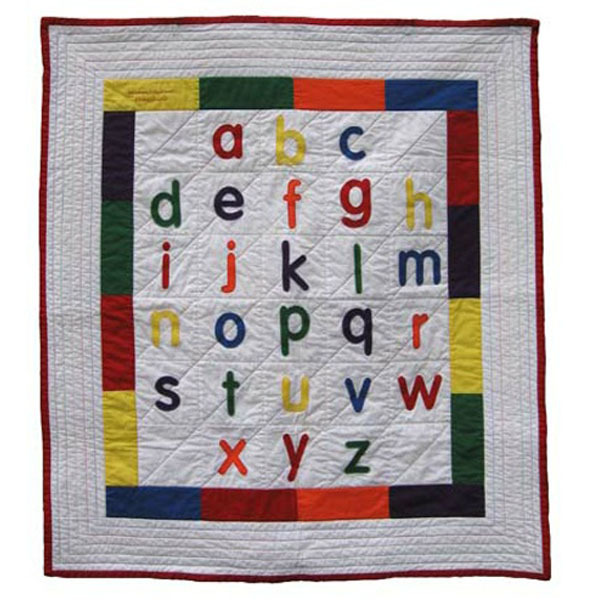 Alphabet cot quilt - create this bright, fun and educational cot quilt using just plain colours - great to perfect your applique skills, and go wild with the quilting to make the design really jump! 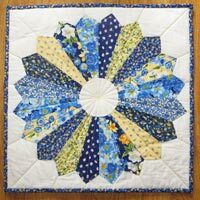 This free quilt pattern uses plain cotton fabrics, one cot size quilt wadding, Bondaweb, and a selection of quilting threads to contrast with the white backing. Download the letters to trace onto the Bondaweb in 3 parts - abc1, abc2 and abc3. A kit containing everything you need to make the Alphabet cot quilt top and binding is available here. 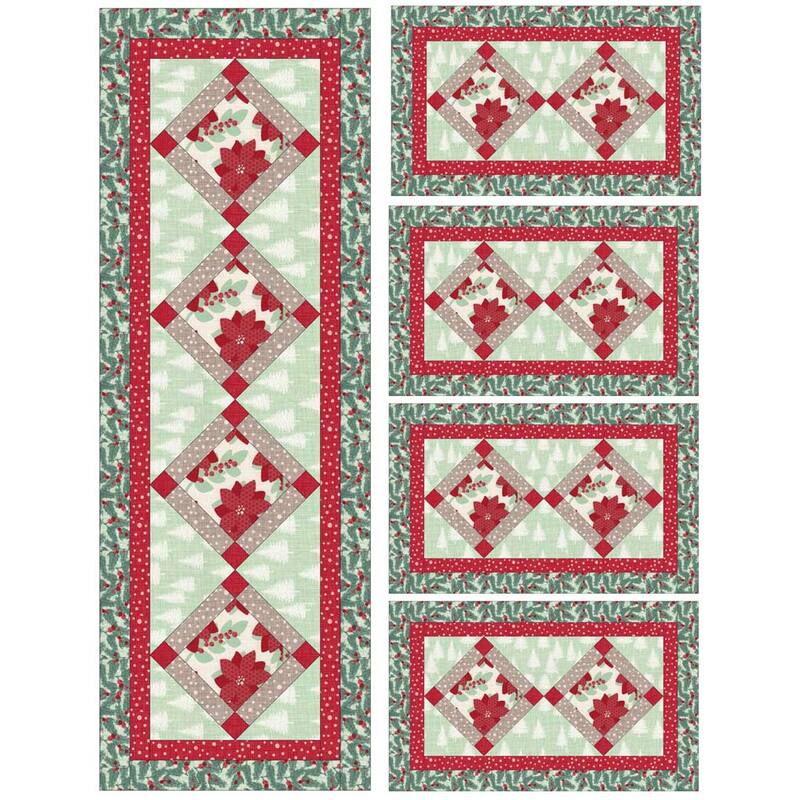 Christmas Table Runner and Placemats - free quilt pattern to make a festive table runner and four matching placemats. The fabrics used are from our Winterberry collection by Moda, but the pattern will look good with any Christmas fabrics, or other prints if you'd like to use the placemats and table runners all year round (a couple of suggestions using non-Christmassy ranges are included with the pattern). This pattern will really smarten up your dining experience! Log Cabin Cushion cover - a lovely 16" x 16" cushion cover using graded shades in the same colour, a perfect introduction to the log cabin technique if you've never tried it before. 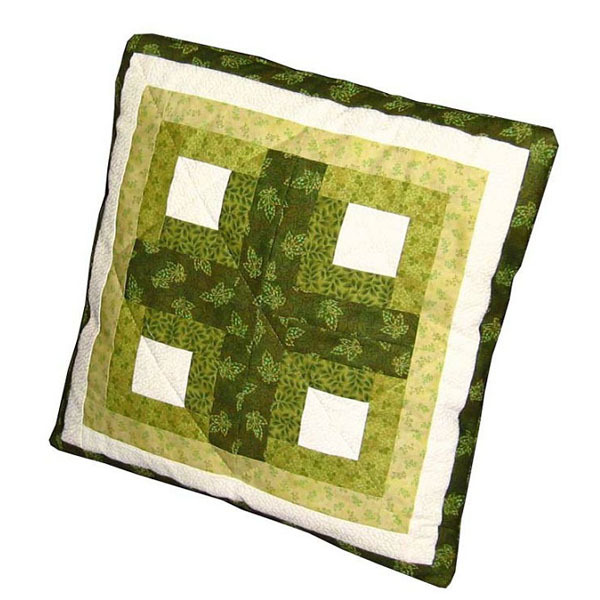 This free cushion cover pattern uses Vilene Stitch n Tear or similar tear away stabiliser, 4 green fabrics in graded tones, cream fabric, polyester wadding, and invisible thread or other matching quilting thread. 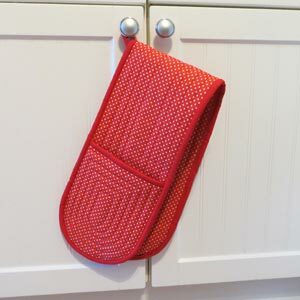 Spotty Oven Glove - Quick and easy, this free pattern makes up a classic oven glove design complete with hanging loop that will instantly brighten up your kitchen! A great way to practice curved bindings and quilting techniques on a small project - this free pattern would be an ideal project to start free motion quilting with. Country lap quilt - a lovely small project to make by hand, using English paper piecing. Download the paper piece templates here (ensure your printer zoom setting is set to 'none' for the templates to print at the right size), and enjoy this therapeutic method in front of the television or listening to some relaxing music! This free quilt pattern makes a lap quilt approximately 41" x 41" in size, perfect as a throw or a winter warmer for the sofa - Autumnal coloured fabrics are ideal for this pattern. Cascade lap quilt - Made using the Cascade collection by Jessica Levitt for Windham Fabrics, this free quilt pattern makes a lap quilt approximately 50" x 50" in size, perfect as a throw or occasional quilt in a contemporary living room or conservatory - modern, fresh fabrics are ideal for this pattern. Lady Slipper Lodge double quilt - Made using the Lady Slipper Lodge collection by Holly Taylor for Moda fabrics, this free quilt pattern makes a double quilt approximately 80" x 80" in size, perfect to finish off a traditionally and tastefully decorated bedroom.